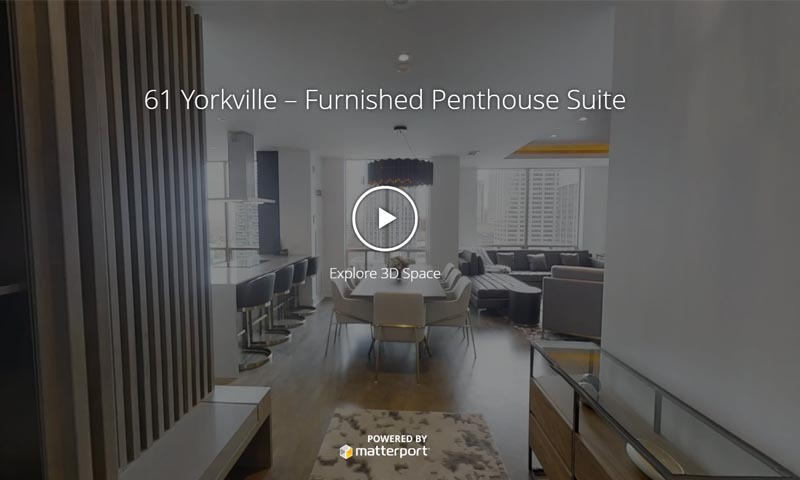 Toronto's most coveted neighbourhood and address, where furnished suites at 61 Yorkville provide the perfect refuge from renovations or time away from home, complete with 24/7 Concierge and incomparable service and amenities. Ideally situated at Bay and Yorkville and exquisitely renovated from top to bottom, your every wish will be anticipated and catered to. Unfurnished suite rentals are also available for longer stays. This is Y. Prices shown are best available, but may be limited to features, finishes, floorplan, availability and occupancy date. Prices shown reflect the average cost per room based on the number of rooms in a specific suite. The cost per room is based on occupancy equal to the number of rooms. Room rates may vary based on location in suite and square footage. These prices are subject to change without notice. Please speak to your Leasing Consultant or contact the Rental Information Line at 1.855.321.0794 for more details. Errors & Omissions excepted. Your short-term furnished luxury apartment rental in Toronto is complemented by an extensive list of newly renovated amenities, including the Genoa Room, media room, fitness centre and boardroom – on top of expert 24-hour Concierge service and so much more.